The 5-star Angsana Laguna Phuket offers several fine dining experiences,one of which is just ateps from the sea. 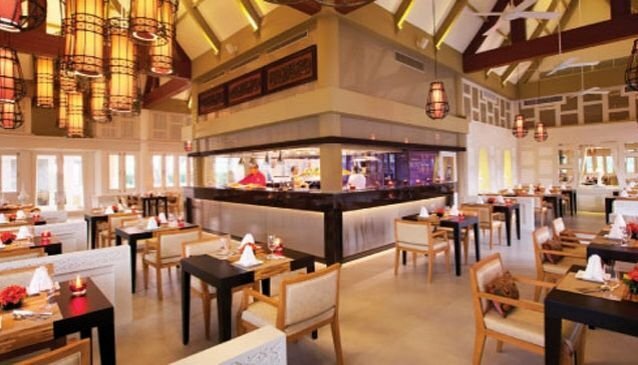 Baan Talay or 'House by the Sea' serves fresh seafood and traditional Thai dishes. You can watch your food being prepared in an open kitchen! Mix and match dishes for a varied experience and to appreciate more of Thai cuisine. Yam Som Poo Nhim, a pink grapefruit salad with crisp soft shell crab and tamarind sauce and Yam Nhua Yang, BBQ beef sirloin salad with crunchy vegetables in Thai spicy sauce are light and small dishes perfect as starters. Recommended dishes also include aGaeng Garee Gai, chicken in yellow curry with potatoes and onions; Geang Phed Ped Yang, grilled duck breast, red curry, baby aubergine, lychee, sweet basil and port wine grapes; Pla Rhad Prik, crispy fresh fish with spicy garlic, chili and tamarind sauce and Nhor Mai Farang Phad Goong, stir-fried asparagus with shrimps in oyster sauce. Diners can choose to sit outside on the patio or the inside with its accents of traditional Thai décor.